His head has all the power! Get ready to transform and roll out with the Transformers Generations Titans Return Leaders! Autobots and Decepticons now power up with exciting miniature heads who have all the power. If you loved The Headmasters, you're going to love Titans Return! The Leaders each include a tiny robot which can change from a small robot to a head of a larger robot - and each vehicle has a bonus base mode! The next stage of the Cybertronian Wars is here, so get yours now! Soundwave includes partner Soundblaster, which forms his head. 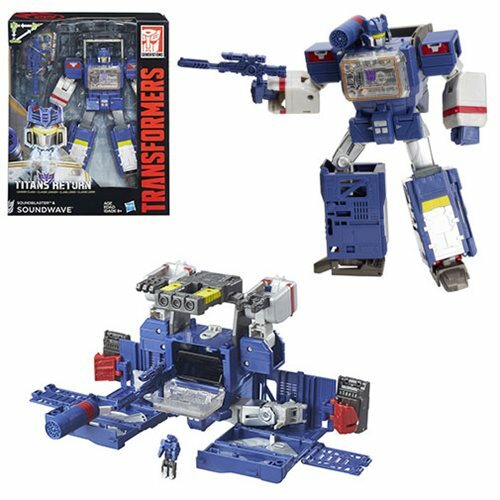 Soundwave's body can become a boombox, a robot, or a battle station for Titan Masters (sold separately). Ages 8 and up.